Creating grass in Blender is a pain. You know you need it for your scene, but you put it off because you know how long it will take. Finding the right tutorial, tweaking settings, rendering, tweaking and re-rendering takes hours, and IT’S PAINFUL. Blender’s strands are long and singular, which makes them great for hair and fur which is consistent; but grass is wayyyy more complex. It’s got sprouts, seeds, color variations, skinny parts, fat parts and flat leaves just to name a few. 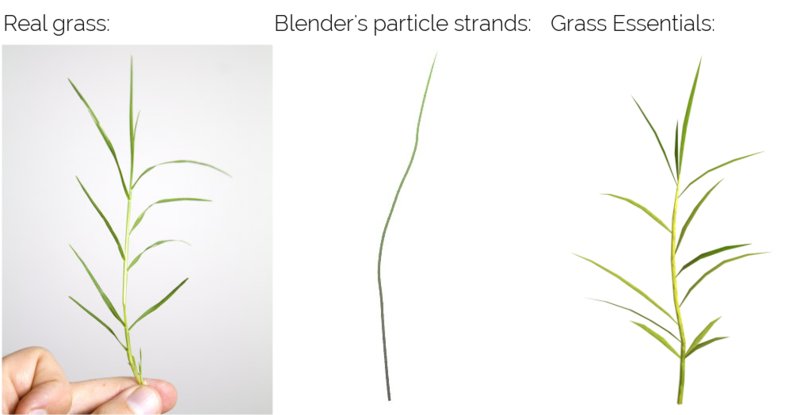 Once you look carefully at a real sprout of grass, it’s easy to see why Blender’s particle strands always fall short. 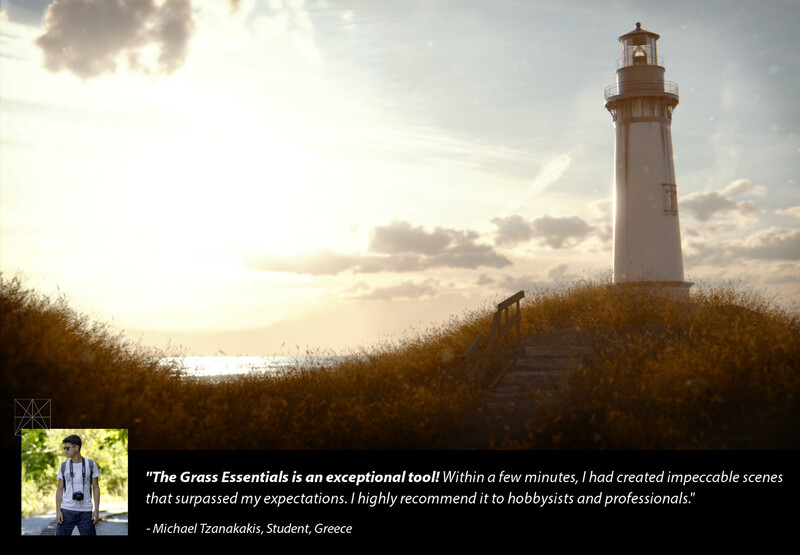 That’s why we created The Grass Essentials… a way to have real grass in your scenes. 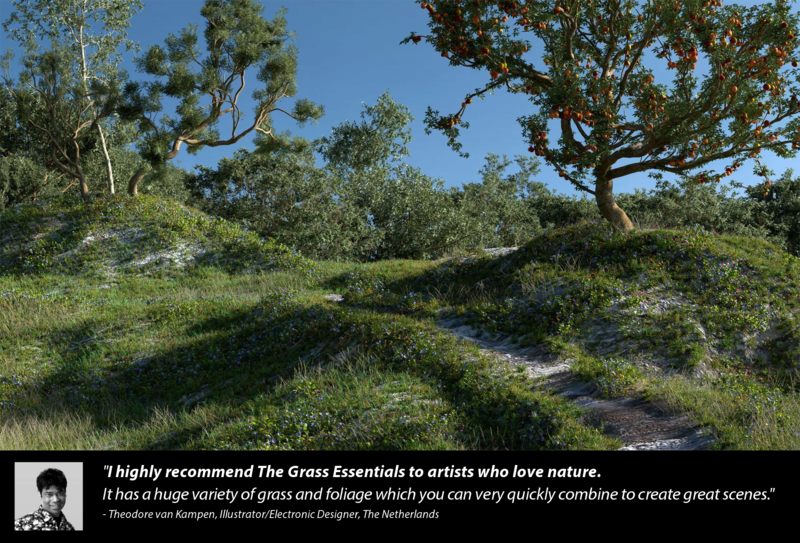 The Grass Essentials is a pack of grass models and particle systems, that you can quickly import to any scene to have beautiful grass. There are 15 Species of Grass, with up to 49 model variations for each. 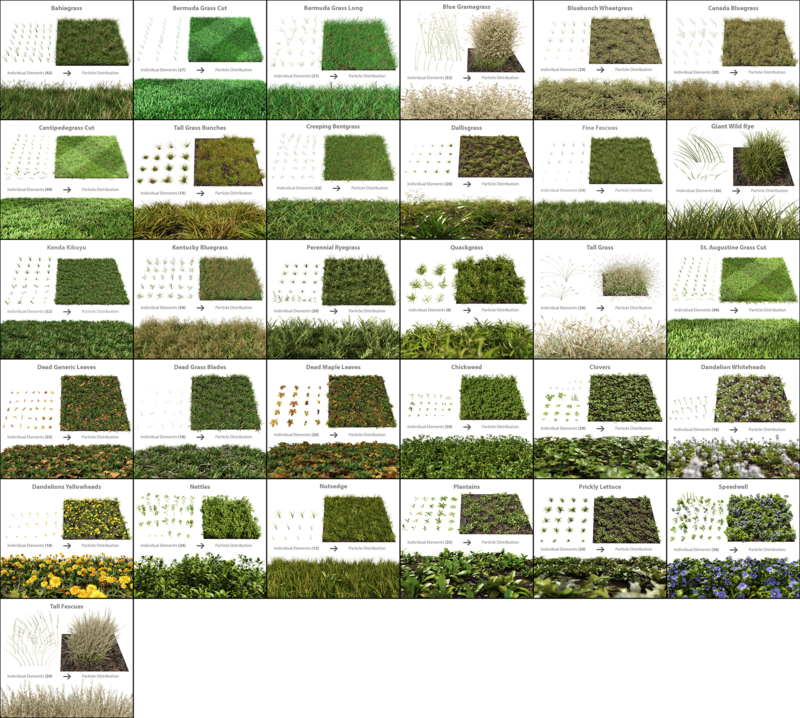 A total of 471 grass models for the most photorealistic scenes available. 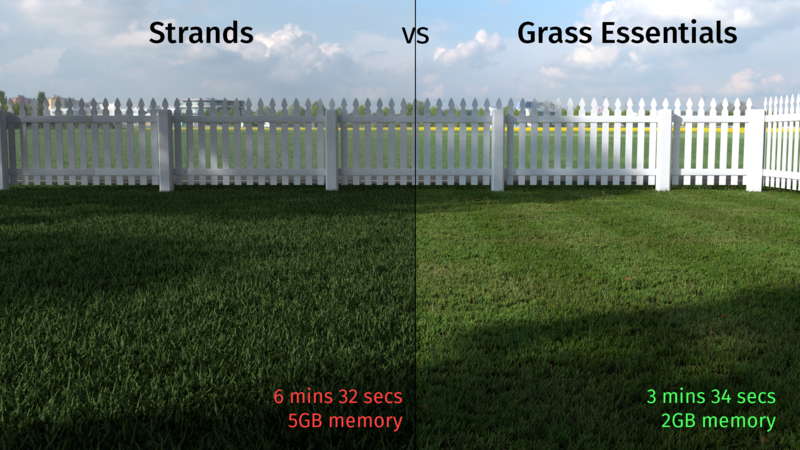 Physically modelled grass actually renders faster and uses less memory than normal strand renders do. That means you get superior results AND faster renders. And with less memory consumption you can now render complex outdoor scenes on your graphics card with less a chance of Blender crashing! 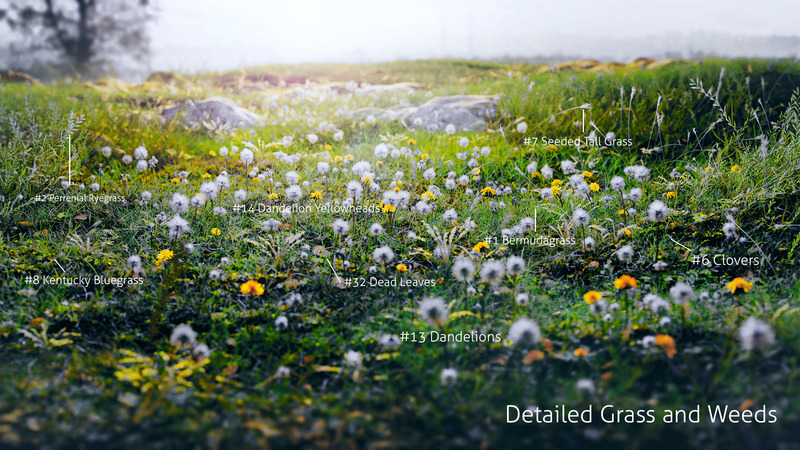 Using the Grass Essentials is as simple as importing the grass species you want, and adding that Particle System to your scene. In the real world, almost every field of grass contains weeds. Even the most carefully manicured lawns often contain dozens of weeds growing beneath the surface! But in CG, almost no one bothers to add weeds! Why? Because they’re a pain to make: Hundreds of species, dozens of variations within each species and no knowledge of what weeds to even make. That’s why The Grass Essentials include a bonus weed pack containing 15 species of the most common types of weeds found in gardens around the world. 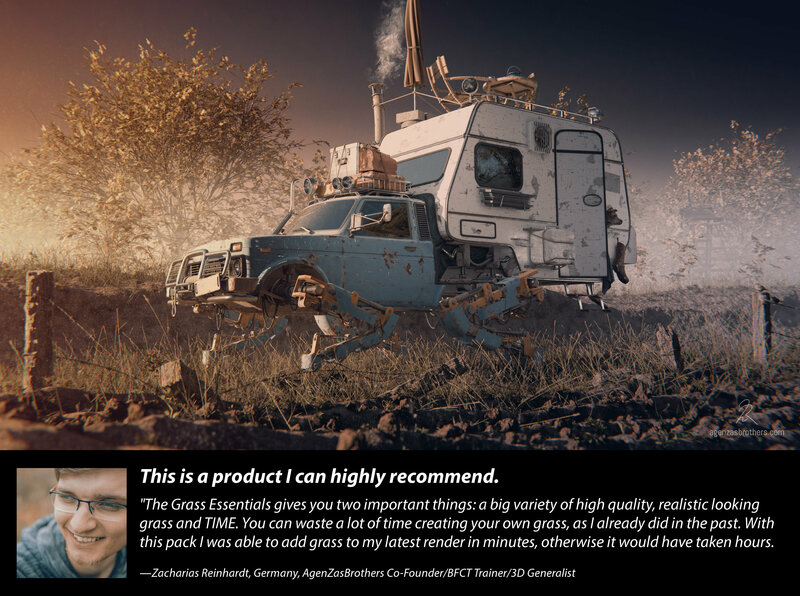 They’re built for Blender and optimized for fast rendering with Cycles, ensuring that your scene looks great without costing excessive amounts of render time. 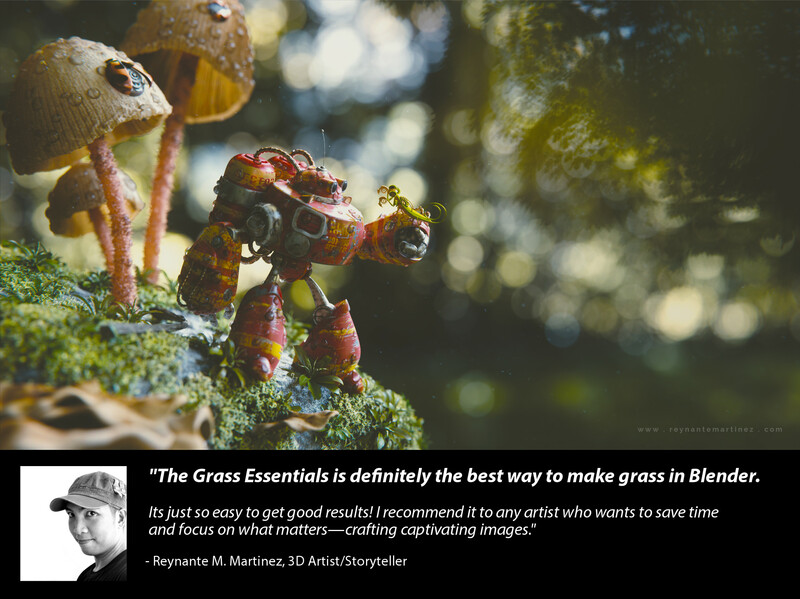 Get the most from The Grass Essentials with included training videos on how to get great looking grass in your scene. 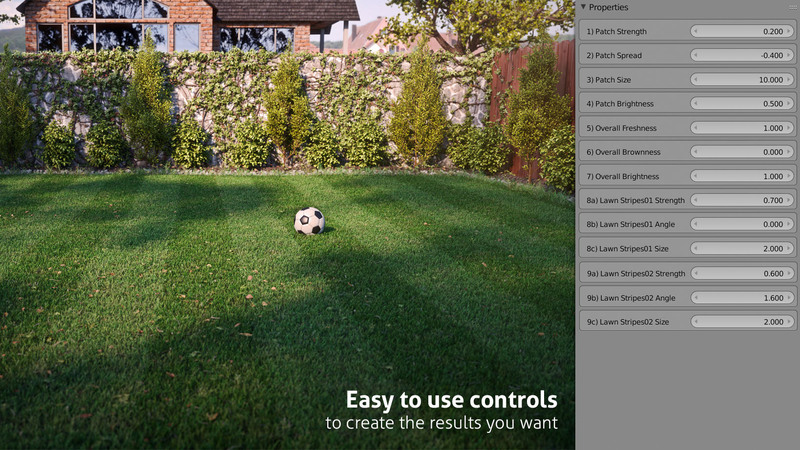 Making a Grass Lawn – A complete tutorial on creating a backyard lawn scene, with grass, weeds and leaves. No problem! 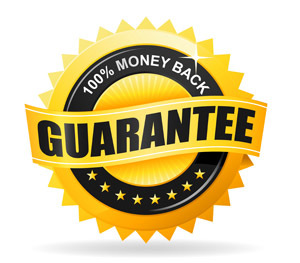 Simply email us at [email protected] within 30 days and receive a full refund. Purchase now for only $84 and start downloading immediately. Great product, easy to use and gives amazing results. It has greatly improved my work. Can't wait to see the 2.8 update. I achieved amazing results with it. 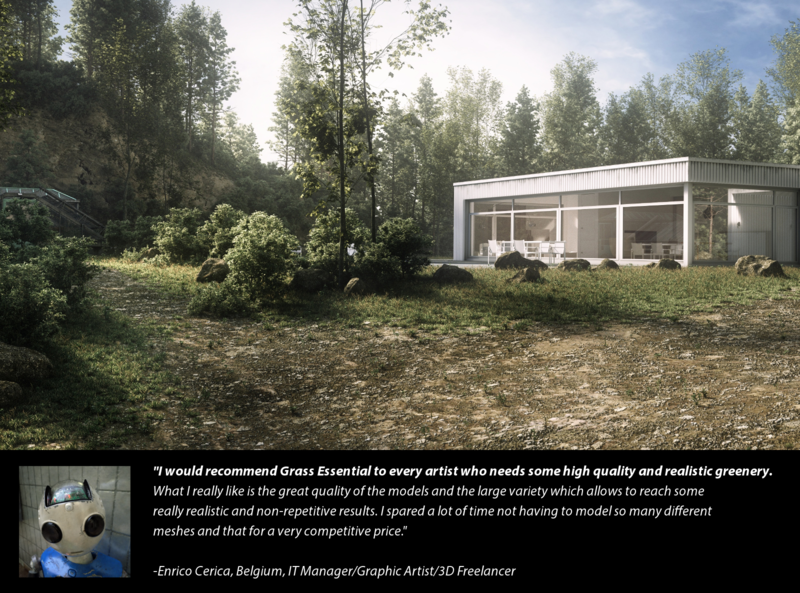 best grass material realistic addon. This is a great product, and super easy to use. 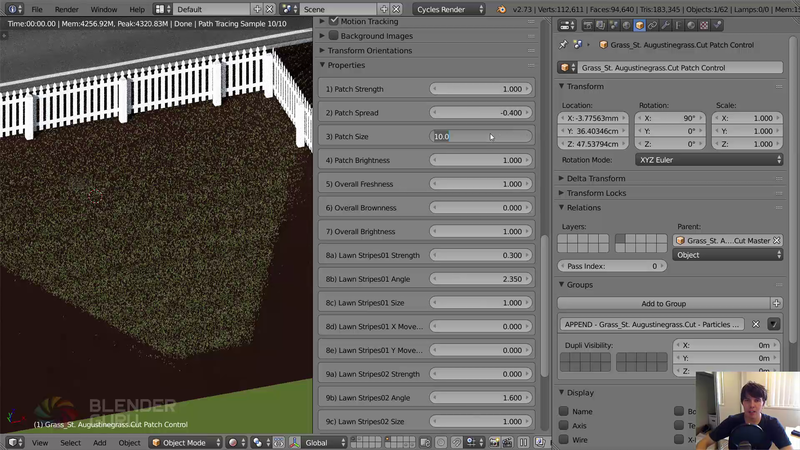 It also is fairly easy to add your own grass models to the existing particle systems and modify and tweak everything. Works fine even in newer Blender builds. just a "must have" !!! Easy to setup and fast to render. The package contains helpful instructions making it perfect for beginners. 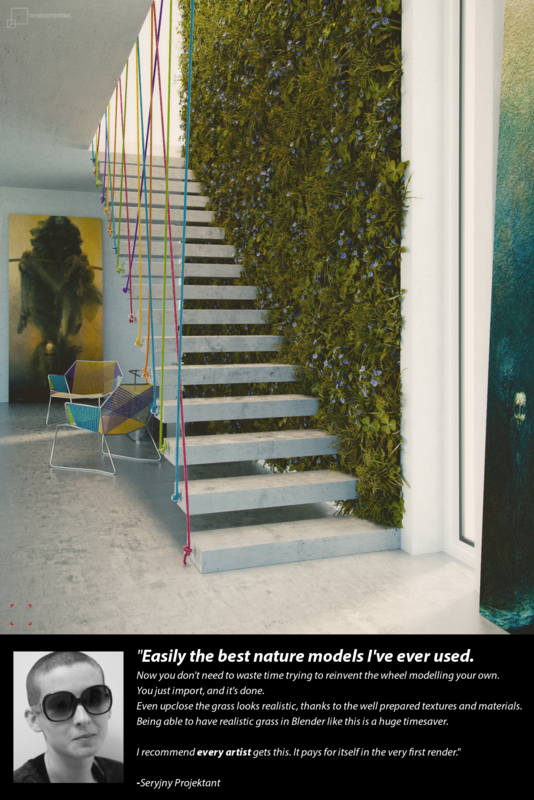 Although it has 15 different species of grass, a broader diversity would be welcome. Opposed to lawn grass either long grass or ornamental grass such as panicum, pennisetum (intensively used by Dutch landscape architect Piet Oudhof) would give added value. Now it's so much easier and faster to make realistic grass. Thanks to Blender Guru! 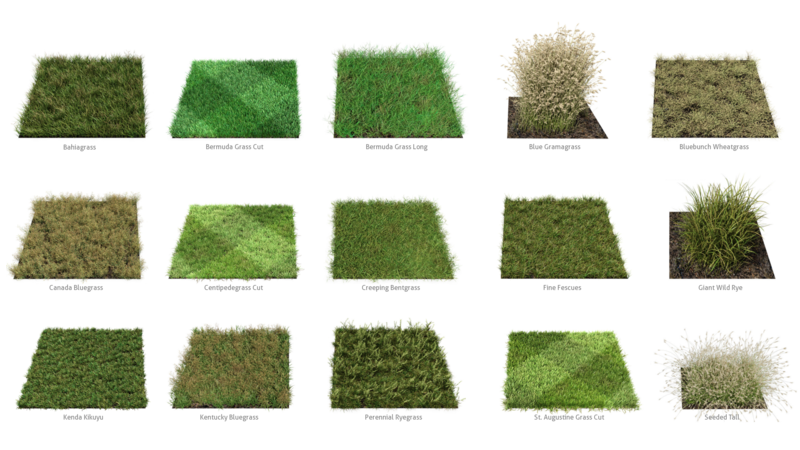 A wonderful product that should cover everything related to grass and other kinds of similar vegetation. 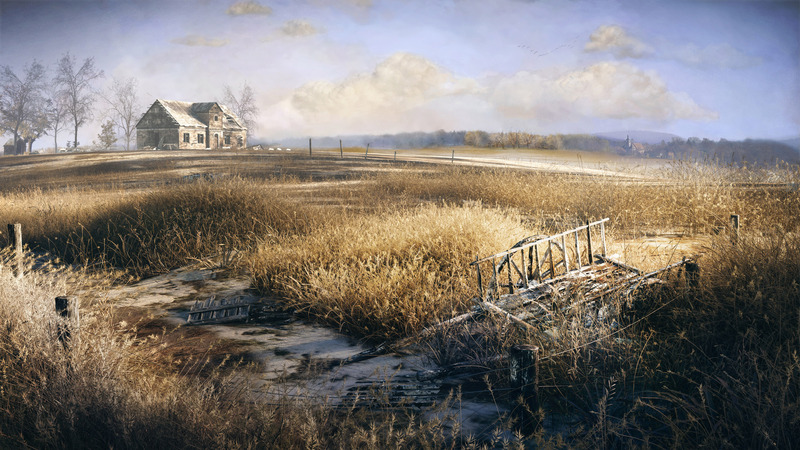 The pack includes a wide variety of grass, weeds and "extras" (such as two types of fallen dead leaves). The pack content is easy to import, and includes parameters that control aspects such as volor variation of the plants, wetness, wind turbulences, etc. All assets are of the highest quality, and allow photorealism.